Poklong Anading. “Anonymity” (2008-2011) is a series of nine black and white Duratrans prints inlightboxes . © Poklong Anading, 2011; Courtesy of Galerie Zimmermann Kratochwill, Graz, Austria. The ethereal and enigmatic serve as inspiration for many of the works currently showing at the Phantoms of Asia: Contemporary Awakens the Past exhibition at the Asian Art Museum (San Francisco, CA). Specifically, this collection of artworks transforms the materiality of objects into explanations of our relationships to Time and the Cosmos. These ideas are certainly at the core of Poklong Anading and Ringo Bunoan’s work. Since a primary objective of art entails illuminating truths that may be dormant in human subconscious or obscured by dominant culture, the artist’s aim is to delve into the past to conjure up truths about the present and possible future. Works from the exhibition look at how traditional forms, methods, and ancient philosophies inform and serve as the impetus for contemporary works. Cultural nuances and long withstanding beliefs play a tremendous role in Phantoms of Asia. Both Anading and Bunoan aim to capture the complexities surrounding our notions of the intangible. They look at our collective human experience and connection with the earth and the environment, in particular, Anading’s creation of a meditative gaze to the ritualistic gestures as seen in Bunoan’s work. With the flash of a bright light to the image of rolled blankets as sculpture, the two artists use simple gestures as a way to communicate and entice a dialogue with the viewer on our complex existence and mortality. Although the popular definition is suitable for the show, the last definition was the most striking, “a representation of something abstract, ideal, or incorporeal”. Both Anading and Bunoan examine the corporeality of objects within an environment as well as byproducts of human existence. The subjects contained in the works provoke the viewer to grapple with notions of transcendence, life, and death. As I stepped into the dimly lit gallery, slowly walking through a pair of glass doors, I saw the work of Poklong Anading. At first glance, the unique display of light boxes from his photographic series, Anonymity (2008-2011), gave the light within the photograph even more illumination. The light against the transparent prints provided a stark contrast to the subject’s environments and accentuated highlights and shadows that would otherwise remain flat. Mirrors reflecting blazing rays of sunlight, seeing bare feet adorned by flip-flops, and the surrounding environments of each subject, Anading does a superb job at making the viewer believe this could in fact be anywhere in the world. The faceless subjects were not only anonymous but where their faces once were became a meditative focal point. These subjects become ethereal beings thus forcing the imagination to wonder and the anonymity becomes a meditation. There is a revealing in the unrevealing. In a visual and figurative sense, Anading removes the subject’s gaze to serve as an interpretation of what transcendence may look like. 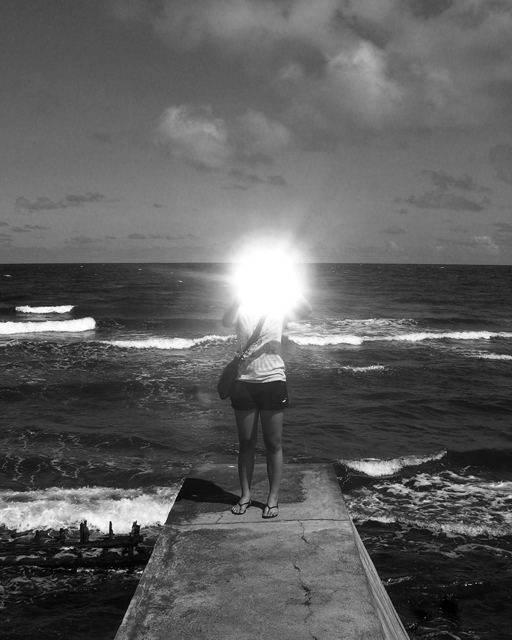 There is a sense of wonder and mystery to the subjects’ lives as the viewer fixates on the light. On the opposite end of universals, Bunoan’s work looks at the concept of death and our connection to the past. 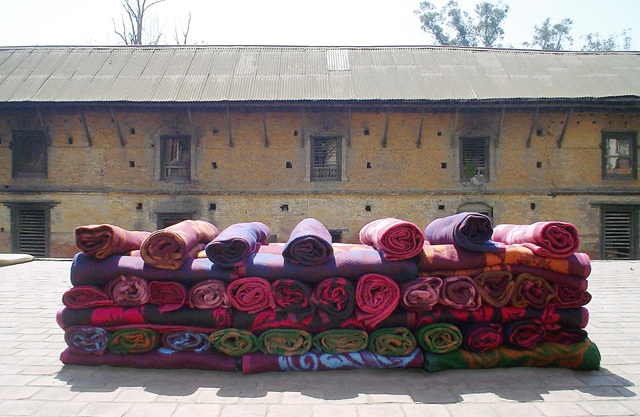 In her work, Passage: The Blanket Project (2007), the performative and sculptural work was created while Bunoan was living in Pashupati, Nepal. 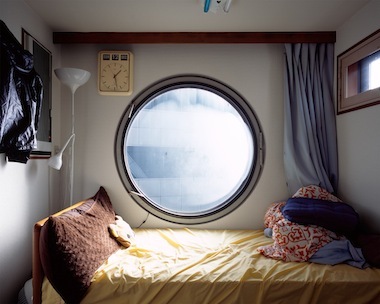 Living with the sick and elderly, she found materiality to be the least of residents’ concerns and worries. Allison Harding, co-curator for the exhibition, reflects on Passage by noting on the object itself, “Once symbols of warmth, comfort, and rest, the blankets in Passage signify the bodies they covered. Partly memento mori and partly the artist’s farewell to Nepal, the documentation of Bunoan’s work from a single afternoon reminds us that after death, traces of us may remain”. In viewing photographs of the Nepalese residents engaging in performative gesture resulting in a sculptural piece that bears a striking resemblance to a casket, the viewer can easily see that much of Bunoan’s work relies heavily on the senses and community. 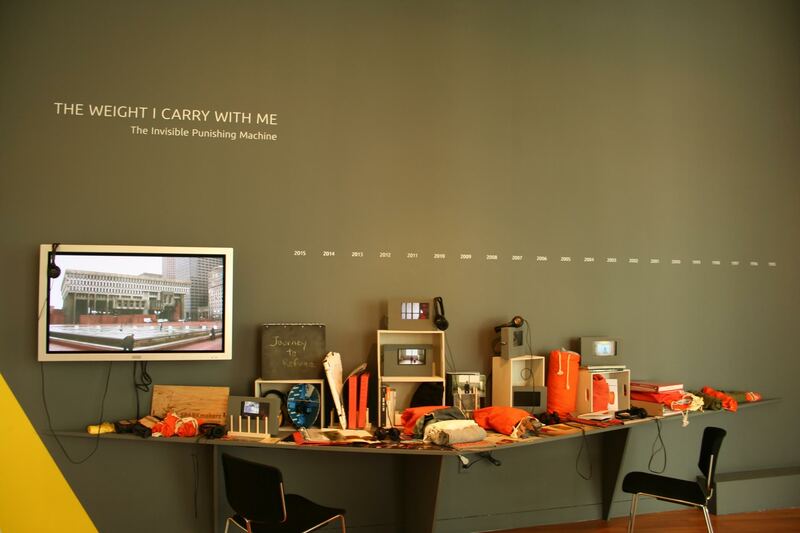 Each rolled up blanket becomes a composite entity, which seems to be a metaphor for the multi-faceted human being, a community, and the interconnectedness of humankind on a global scale. The ceremonial nature of the work serves to remind the viewer that physical remnants prevent us from being wholly detached from spirituality or one another. The work of Poklong Anading and Ringo Bunoan fit perfectly in this exhibition in that each set of works extrapolates the enigmatic nature of spirituality, life, and death. Regardless of a viewer’s beliefs, there is something inherent in the pieces that transcend the physical human experience. As humans constantly struggle to understand ourselves, Anading and Bunoan provide us with visual representations of the intangible because the art provides yet more extraordinary explanations to ideas we so desperately try to wrangle and comprehend yet consistently elude us.